Stockholm, based on a real-life event that took place in Sweden in 1973, shows how the phrase "Stockholm syndrome," in which victims eventually side with their kidnappers, came into existence. 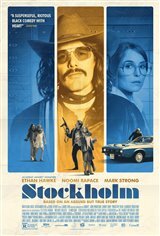 In 1973, Lars Nystrom (Ethan Hawke) walks into Stockholm's largest bank with a machine gun in a bag. He fires a couple of rounds into the ceiling, sending the customers and employees diving for cover. When he approaches a teller named Bianca (Noomi Rapace) and demands if she's set off the alarm, she admits that she did. Rather than being angry, Lars seems content about what Bianca has done. As it turns out, Lars isn't trying to terrorize anyone, or even rob the bank. What he wants is the release of his old bank-robbing buddy Gunnar Sorensson (Mark Strong) from a Swedish prison. Local police chief Mattsson (Christopher Heyerdahl) agrees and delivers Gunnar to the bank. However, now Lars and Gunnar, who are holding three hostages, have to figure out how to get away with their lives intact. As the event plays out, Bianca learns about how Lars once saved the life of an elderly man and she notices how much care he takes with her, making the ordeal as easy as possible for her and the other hostages. She slowly begins to identify with Lars.